OMG! My "Tudor Queens" series is finished! This is the eighth and final image in the series. The last time I attempted a series (The Seven Virtues, in 2005) I stopped after image 3 of 7 and never finished it. But this one was so much fun, I could paint those Tudor queens all over again! There is so much artifice in the portraits of Elizabeth I. She wears giant dresses that seem to weigh more than her with all the jewels and ornaments. And those elaborate wigs, huge starched collars and detailed headdresses! How long it must have taken to get dressed like this?! Perhaps a bit too long to do it every day. So I'm going to assume that the decorative excesses were mainly for representative purposes (as Queen of England she was practically obligated to look more splendid, rich, and fashionable than everyone else around her), and that she actually wore much simpler outfits on most days. There's also a fun-to-read biography: "Elizabeth" by Carolly Erickson, who also wrote about Mary Tudor, King Henry VIII, and Catherine the Great. I put her in a forest setting because I think the real Elizabeth would have liked this - a relaxing rest from restrictive court life, nothing artificial here. And because my gallery needs more green paintings anyway. I feel like I'm finally starting to figure out the gorgeous sunlight-shining-through-green-leaves light. Photoshop and Wacom tablet, as always. Took about 20 hours. Yes, Elizabeth did wear lighter and less layered gowns at times. For example the dress in the Rainbow Portrait has a slow neckline and top-layer gown is loose and open showing her much closer-fit bodice that would cover her chemise. I'm not sure about those bracers looking things on the arms, but I like the slashed sleeves and the pattern on the bodice. Elizabeth the first is awesome! Elizabeth I was also called the Fairy Queen, so it's also fitting she is in a forest. Proclaimed most beautiful and popular queen in England's history. You did a wonderful job on her. I think you left out Lady Jane Grey, the 9 Day Queen before Bloody Mary. She was Edward's chosen heir. Stunning work! WOW! This is AMAZINGLY BEAUTIFUL! amazingly beautiful! I just love Elizabeth!! My mind is BLOWN by this. I'm literally stunned into silence. All I can say is that this is legendary like the woman portrayed. You are the only one I can find that does art on (for example Ann Boylen, Queen Elizabeth etc... I cant wait to see more. I know the history of these women and like to see the cloths they wore. Stunningly beautiful! I love her smile and the setting you chose. holy moly! the dress is so beautiful and bright LOVE IT! Just decided to come back to deviantart and saw this pleasant survive. I'm impressed with your imprivement Kristina! Elizabeth I <3 My fav. Oh wow you make such beautiful paintings !! A beautiful work of art. Simply fascinating! Excellent! The cloth is amazing and she she looks great too ! Really nice work. If I should name something negative, it would propably be the background. It's good to make it blurry to get the focus on HER, but that's just too blurry. Maybe I'm a little wrong and it isnt just the blurryness, but the rough painting of the trees/leafs combined with the quite monochrome colouring back there. Just an idea, a halo-like light behind her head, formed by light coming through the trees maybe ? This is beautiful. I'm not familiar with the subject, but the composition is nice and the way the light reflects, especially off the dress onto her face, is well-done. yes, the sunlight coming through the trees is beautiful. The lighting through the leaves is done perfectly in my eyes, but then again I no painter! It's so eye-catching and beautiful! I love the way you have portrayed Elizabeth I, I think she would actually go and find a peaceful spot in the woods, when she has had enough of life at court! 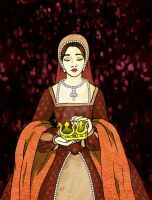 Plus she's one of my favourite Tudor Queens! The light is so beautiful... it's just so real.. you really feel the translucence of her skin... the fabric. Breathtaking. .